Classical crafts on a modern movement. 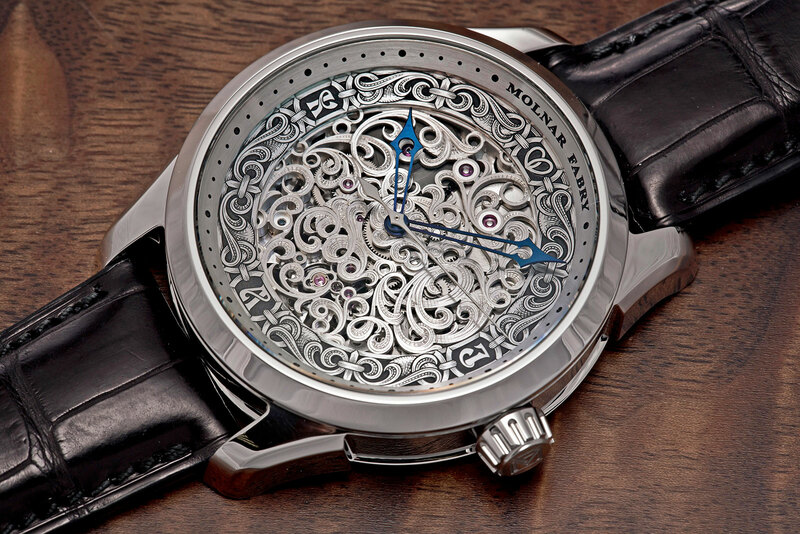 All of Molnar Fabry’s recent works have been either based on vintage movements, from repeaters to split-seconds chronographs, or the simple but effective ETA Unitas 6498. 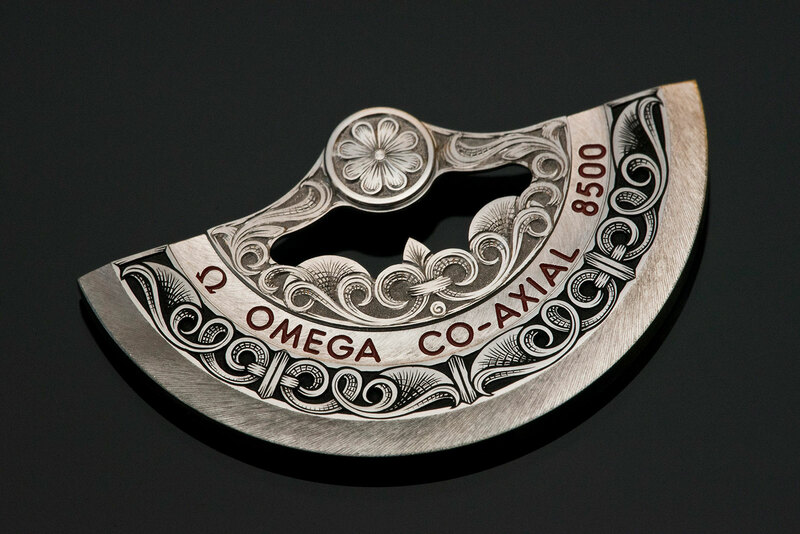 The Slovenian brand’s latest creation, however, originally started life as an Omega Co-Axial cal. 8500, a top of the line, contemporary movement. 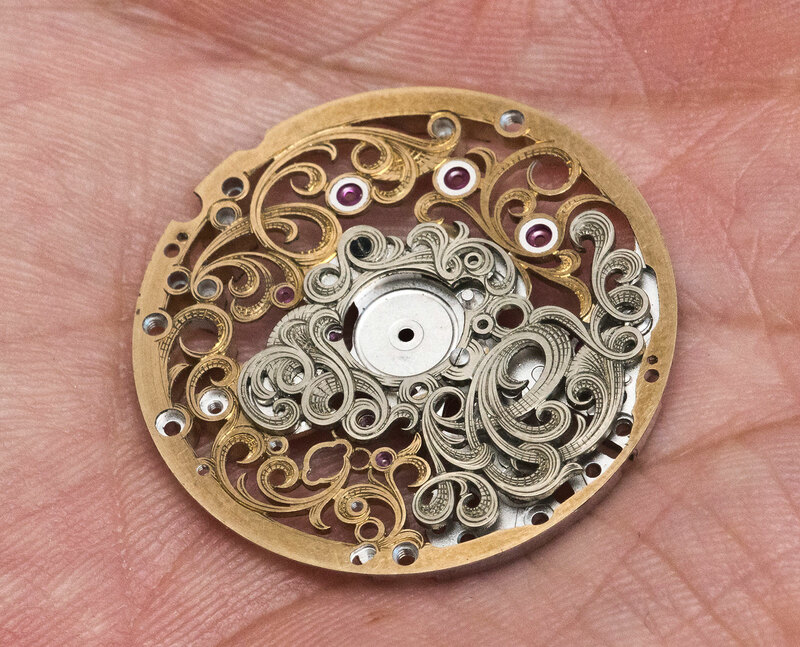 Having trained as jewellers, Molnar Fabry’s founders rely heavily on elaborate embellishment like piercing, engraving and shading, all of which are liberally applied to the cal. 8500. 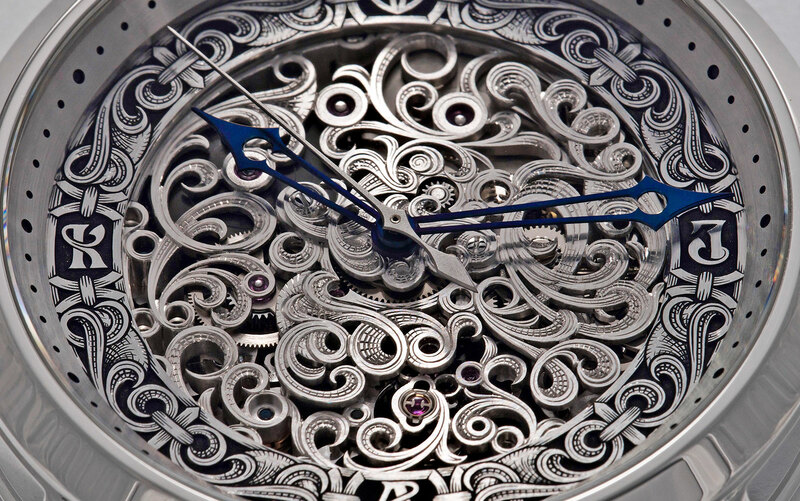 The intricate decoration is a striking juxtaposition against the modern, mass produced movement. Introducing in 2007, the cal. 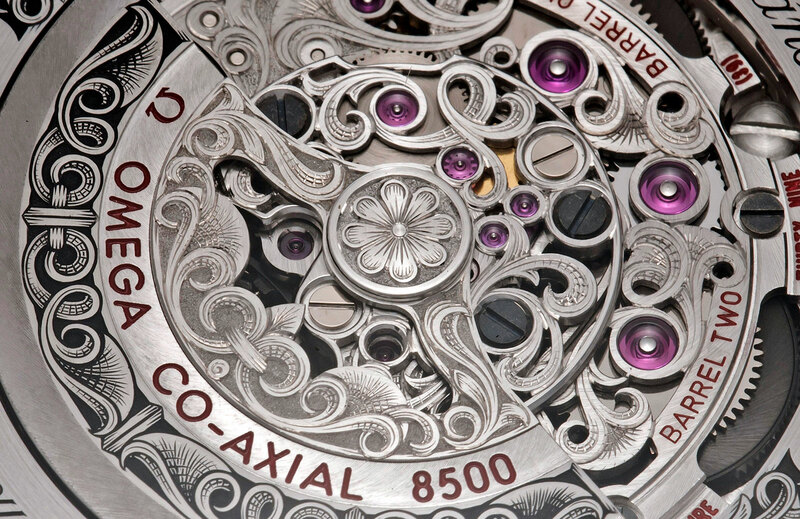 8500 is from Omega’s earlier generation of high-end movements (the latest is the Master Co-Axial cal. 8800). 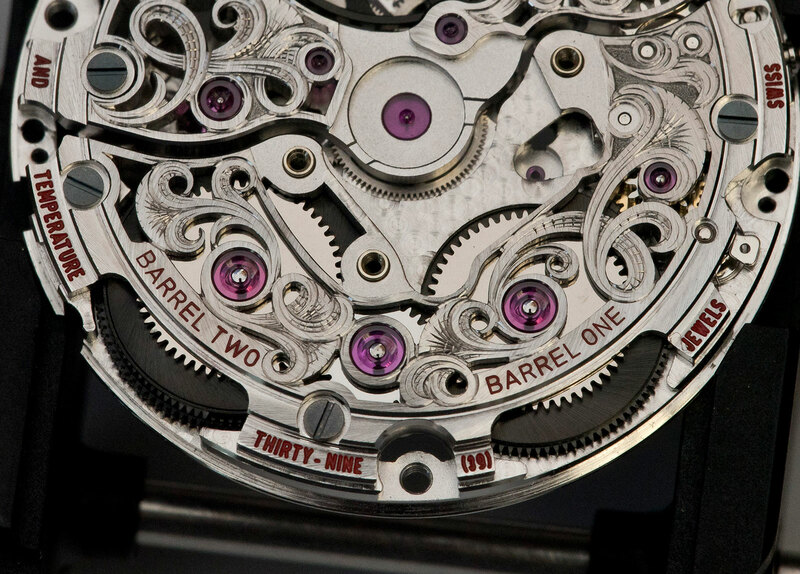 This particular movement came from a Seamaster, which no doubt sacrificed itself for a noble cause. 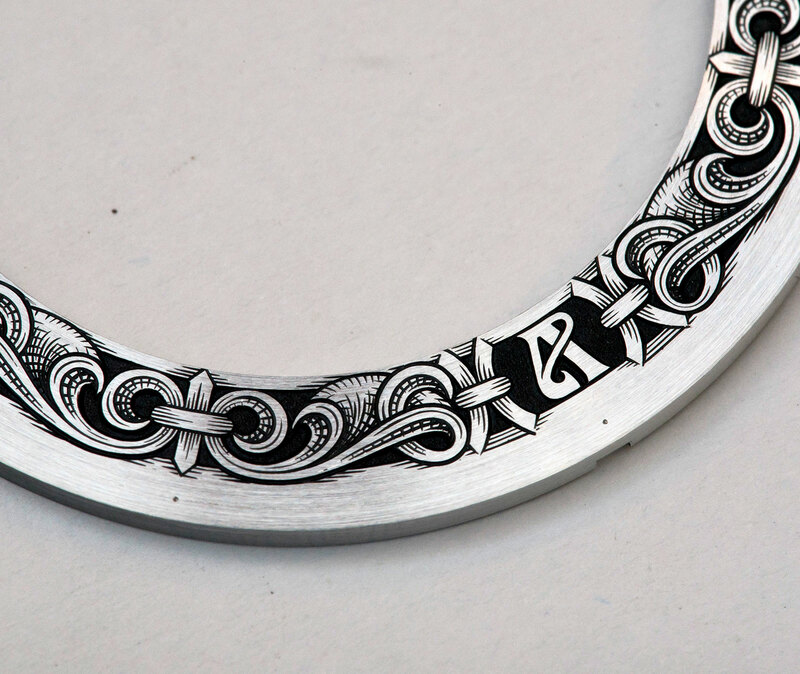 It’s been skeletonised and engraved by hand, which means the bridges and plates were cut out with a saw, while the surfaces were engraved with a burin. Because the watch lacks a date function, which is found in the stock cal. 8500, the main plate had to be modified to remove the date mechanism. 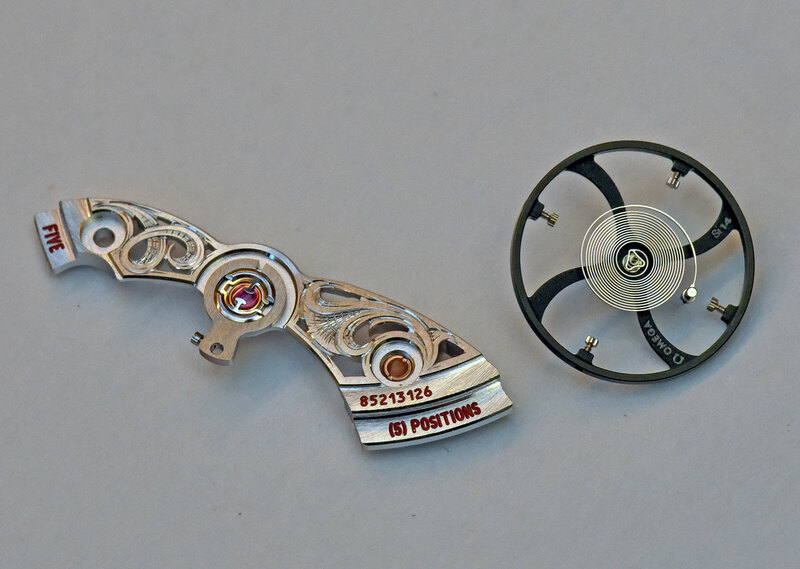 Another modification was the replacement of the Si14 silicon hairspring with a conventional, flat Nivarox spring. Molnar Fabry also manufactured a second plate to sit over the base plate, so as to hide the hour wheel and keyless works. 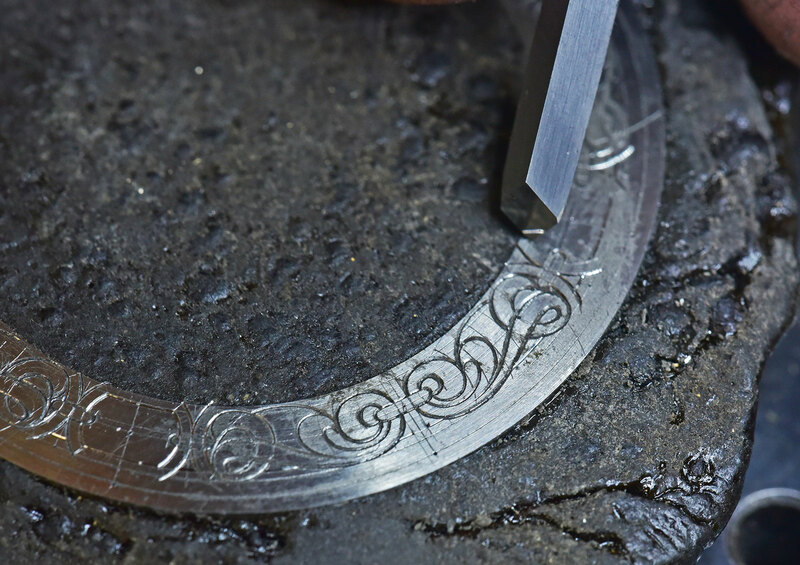 A hand-engraved chapter ring was also installed to form an approximate hour track. 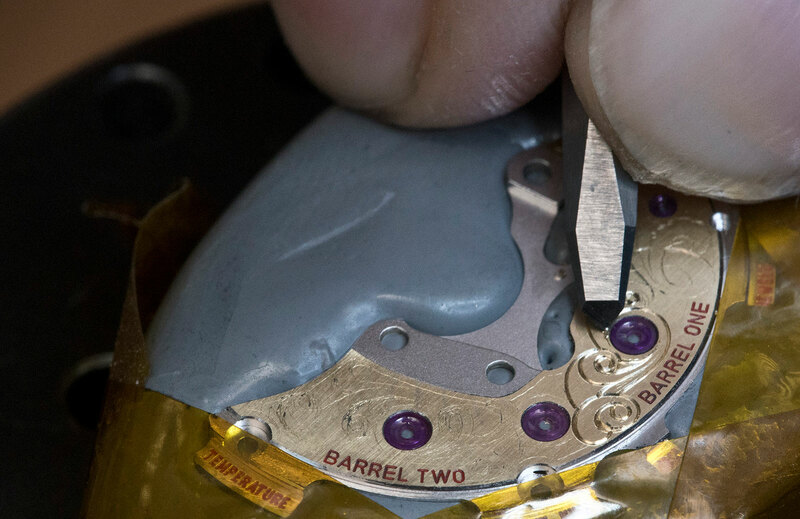 The rest of the watch is largely as it was originally, retaining the signature red lacquer-filled engraving on the movement, as well as the black-coated screws and barrel. The external components were entirely produced by Molnar Fabry. 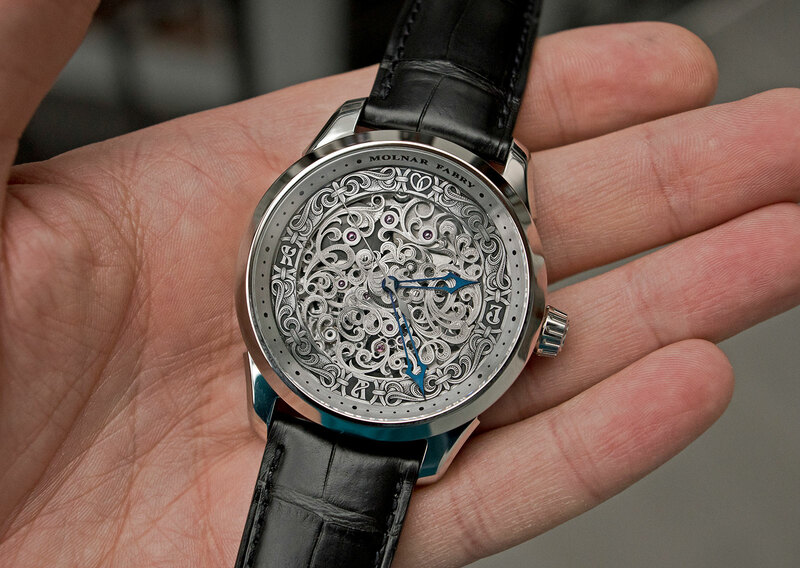 That includes the 44mm stainless steel case, as well as the open-worked, blued steel hands. 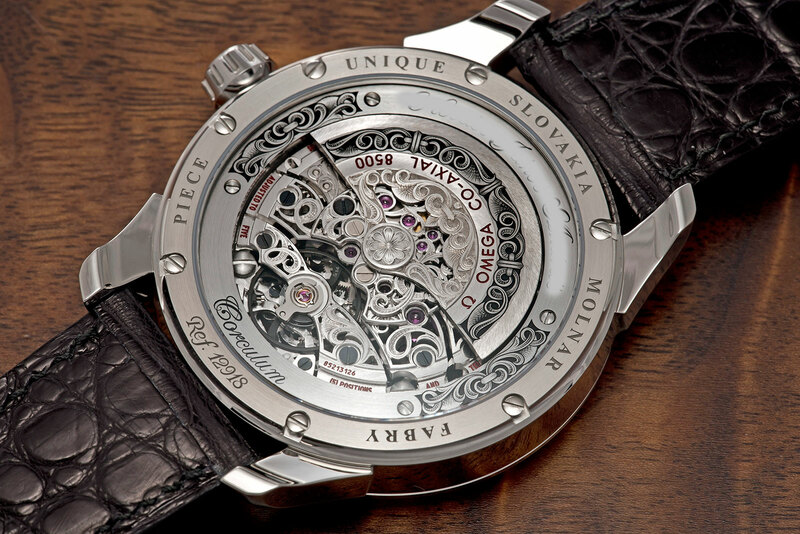 The Corculum was custom made for a client, though similar watches can be produced starting at €15,000. As it once was, it will be again: starting in 2020 the SIHH and Baselworld watch fairs will take place in sync, ending a parting that took place about a decade ago. It also comes after several industry heavyweights, including Thierry Stern of Patek Philippe, publicly stated their preference for the fairs to coincide. While today SIHH happens in January, followed by Baselworld in March, their schedules will align the year after next. 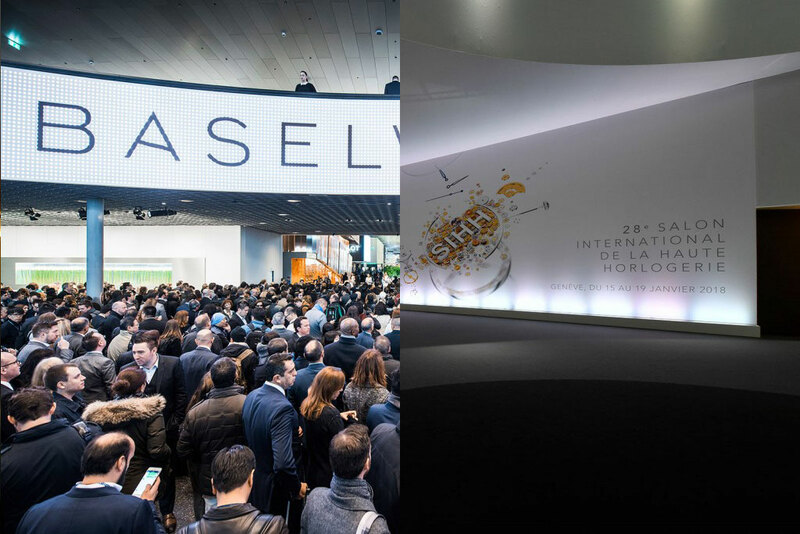 In 2020 SIHH will take place from April 26 to 29 in Geneva, followed by Baselworld from April 30 April to May 5. The “synchronisation” will last until 2024, after which it will presumably be extended if the fairs still face defections. While this has been couched as a major achievement by the organisers of both fairs – Baselworld chief Michel Loris-Melikoff is quoted as saying “This partnership… represents a major breakthrough for the future” – it does seem reactive, especially for Baselworld, which has been pummelled by bad news since the dam broke in the summer. Even SIHH suffered attrition when Richard Mille and Audemars Piguet announces 2019 would be their last year at the event. In the sameness vein, the move to cooperate with SIHH might have been eased by departure of major exhibitors like the Swatch Group from Baselworld. Though both fairs are notably different, with SIHH being more upscale and dominated by brands owned by Richemont and Baselworld historically having been more accessible, there are obvious merits to doing it together, especially for attendees who travel from far away. And there’s the more fundamental benefit of having warmer weather in spring, as opposed to winter in Geneva. It also makes sense since both fairs have been converging philosophically in recent years. SIHH has been growing more democratic, having opened itself up to the public for the first time this year (which Baselworld always was). Dates aside, the formats of both fairs appear to be staying the same in 2020. More details on this as they emerge. Rene Kamm departs in the wake of the Swatch Group's departure.